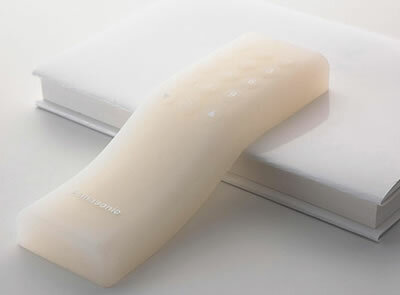 This creepy gel remote concept seems cold and lifeless when it is turned off. However, when activated a soft light emanates from within the device; the center rises and falls as if breathing. "A remote is the ideal metaphor for the disturbance electronic distraction poses to life. If we had to interrupt its life before it could interrupt ours, we may think twice before picking it up." I think it is a lot easier to under stand another flexible, malleable (and conceptual) pointing device, In eXistenZ, a 1999 film starring Jennifer Jason Leigh, Jude Law, Ian Holm and Willem Dafoe, leading game designer is testing her new virtual reality software, eXistenZ, with a group of players. They use an unusual pointing device, the eXistenZ Metaflesh Game Pod, described as having been grown from modified amphibian embryos. It throbs and trills when you stroke it, manipulating the game play. Now, that's a conceptual remote control I can believe in. From AdBuster's Psychodesign via Next Nature.